Madison, New Jersey, is a lovely small town slightly less than 25 miles from downtown Manhattan. 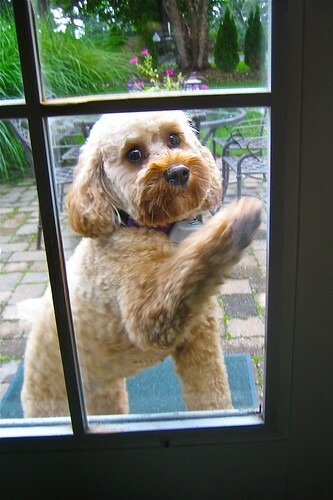 I returned for a second year staying five weeks with Codie, a now-2-year-old Cockapoo, bringing along my friend Doris Strimple. View a slideshow of Codie from July, 2008 and 2009 by clicking on her photo. To return to the blog, use your Back arrow. Codie has matured in the year since I watched over her in July, 2008, but she plays the “I-want-in/I-want-out” game all day long for she must monitor of all neighborhood activities. The Vezza family planned sightseeing in both Belgium and Rome before taking a boat to the northern tip of Sardinia where they stay for the remainder of their vacation. Doris’s days are filled with walking, sewing, quilting, and embroidery projects, but she brought only four projects and is working on the last one although our time here is only slightly half over. I fill my days with computer projects (most for pay) and keep in touch with friends and family via Facebook and email. We’ve managed a couple of “fieldtrips” for which I’ll write separate posts. House/dog-sitting last July in Madison, New Jersey, while the Vezza family visited Sardinia, Italy, was a unique experience. After we arrived on June 27, the family welcomed us and immediately made us feel completely at home. Diane drove us on a tour of the town pointing out essential places: grocery stores, restaurants, library, swimming pool, the train station (perhaps a mile from their home which is, by the way, on Wisteria Ct.), and a free place to park when we took the train into NYC. The next day Doris and I walked the Cockapoo (Codie) on a nearby walking/biking path in the morning and explored the area by car in the afternoon. When I wasn’t sure where I was (for the streets wind around), I tell Doris, “Well, theoretically…” As my girls know from their childhood, we might be in trouble when Mom said that. I’m right about where I am most of the time, however. Click on the any photo below see a slideshow of Codie in her daily activities. Use your browser’s back arrow to return to the blog. 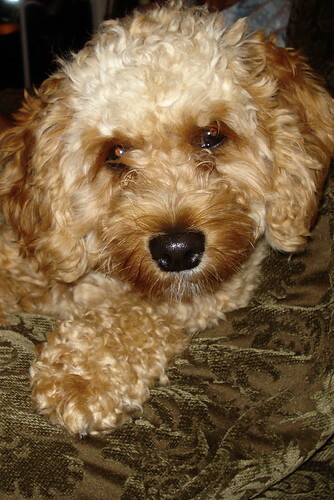 Codie is a lively one-year-old Cockapoo who was under my care for a month in Madison, NJ.